At one time in its history, this was a Hell's Angels bar. One summer the Gyspy Jokers showed up once too often and there was a small war that removed the Jokers. The riot squad went thru kicking motorcycles and clubing the gang members and soon there was an unwritten law that no more than five members Flying colors were allowed in that area of town. 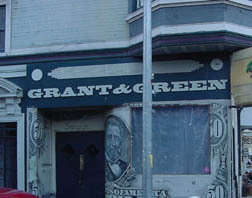 I have been enjoying the Grant and Green since the sixties. It was small and funky. Johnny Ace, Johnny Nitro, rock and roll, blues. Very casual. On an evening after dinner in North Beach we liked to stroll up here and catch the band and between sets walk out into the cool of the evening to perhaps check out the "Lost and Found" next door or the "Saloon" down the street to see what other bands are playing that night. I like to take visitors from out of town on a tour of the upper Grant Avenue in North Beach. The crowd at the Grant and Green is mostly local. The club has new owners now and they have renovated the club. The music has changed, the blues are gone and sadly, it no longer has the same vibes as before.